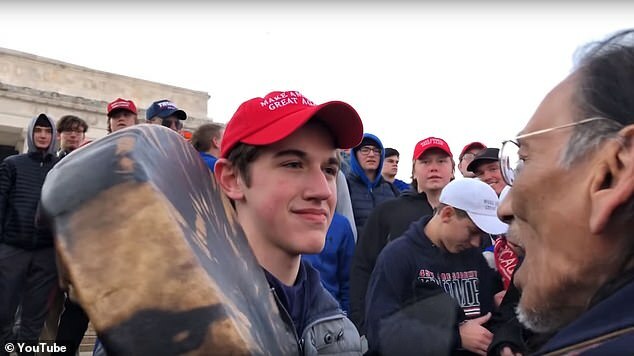 This is the shocking moment Kentucky students wearing Make America Great Again hats appear to mock a Native American man at a rally in Washington. The footage shows one youth staring at and standing extremely close to the elderly man, identified as Vietnam veteran, singing and playing a drum. Now a diocese in Kentucky is looking into the video that show students, possibly from the diocese's all-male high school. Videos circulating online show a youth staring at and standing extremely close to an elderly Native American who is singing and playing a drum. Other youths, some wearing clothing with Covington logos, surround them, laughing and shouting. Many of the youths are also wearing 'Make America Great Again' hats. The Indian Country Today website identified the elderly man as Nathan Phillips, an Omaha elder and Vietnam veteran who holds an annual ceremony honoring Native American veterans at Arlington National Cemetery. State Rep. Ruth Buffalo, a North Dakota state lawmaker and member of the Mandan, Hidatsa and Arikara Nation, said she was saddened to see students showing disrespect to an elder at what was supposed to be a celebration of all cultures. 'The behavior shown in that video is just a snapshot of what indigenous people have faced and are continuing to face,' Buffalo said. Kind of reminds me of???? Oh yeah, ANTIFA. Except that's not what happened and the full video has surfaced. They approached the Trump hat wearing kids taunting them. sure dude, a native american vietnam vet & associates were taunting a bunch of punks. That is exactly what happened. The elder walks up to the kids, gets in their faces and, like kids, they don't know how to react. Most of them just dance along, which is childish, because they are children, but not offensive to anyone with a brain. You are a soulless liar who deserves false accusation if you are attempting to be sarcastic instead of going to see the full video first. The reporter falsely claimed it was the entire video. The entire video is over two hours long. These kids were taunted and called racist names for more than an hour before this short part of the video was released. This is journalistic malpractice. The video was edited to support the writer's perverted and disgusting viewpoints. These young men deserve your respect, not your contempt. These are generation Z kids - not millennials. This is the best generation of young people to come around since the silent generation. God bless them. I go WAY out of my way to hear pow wow music. I like it. Just relax and listen. ...this entire article has been shown to be a lie, as the kid released video from 3 different directions showing the vet and his drum were the aggressor, and the kids did nothing. I hope the kids sue the crap out of every news outlet that told the lies. Too bad they didn't have the vet arrested for assault.